One of my New Year’s resolutions for 2013 was to become a bit more techie – I am totally inept. To prove my commitment, I have spent more time on Facebook in the last week than in the whole of last year. It was just, I swear, to keep track of the exciting news of the week – Brazilians taking to the streets, and well, the occasional spying on my friends’ lives. This protest has been now going on for almost two weeks and there is no clear signal that they will stop. And you think, in Brazil, you must be joking! How is it that the country globally known for happiness, economic success and an inspiration for poverty eradication has exploded in massive protest? Protest at this scale is in fact very unusual in Brazil, this one being the largest since the 1980s when Brazilians overthrew military rule for democracy. Recent protests erupted against urban bus fare increases. Anybody who had the privilege (no irony, it is a life-changing experience) to get a bus in places like São Paulo would certainly agree that protests started on very reasonable grounds. Urban transport in Brazil is expensive and inefficient. Buses are slow, old and overcrowded – in case you are wondering, yes, even more sardine-like than the London tube. Change does not occur because transport companies lobby hard, and find very gentle ears ready to listen among many public officials. Protests crossed the boundaries of the Brazil’s ordinary political life in reaction to police violence – and what a violence with teargas in eyes, indiscriminate beating, arrests of peaceful demonstrators. Authorisation to violence was probably given hoping that business as usual would soon return. But enough is enough. Many Brazilians just felt that the right of expression was too minimal a requirement to be put into question. More protesters, more demands – sounds about right. Cheaper bus fares has become just one among many asks, ranging from the end of corruption and overspending on the World Cup and Olympics, to better public services. All this is very exciting and totally new for a generation of Brazilians, but if you are imaging multitudes of poor people speaking for themselves and making life hard for those in power, pause one second. This is another film. At the very heart of the protest there are Brazilian middle classes, old and new, lower middle and medium middle income, and who knows some infiltrators from the upper classes. This is not necessarily bad news, and has some consequences that can favour the poorest too – or maybe not. On one hand, protests have already brought some results. The bus fare increases have been cancelled. In a public pronouncement to the nation President Dilma committed to some measures to improve urban transport, public health and education and increase social accountability. What her government will actually deliver is a very – very – different matter, but this is nevertheless a start. On a more abstract level, demonstrations have been nurturing a new sense of the nation as a political community. While protest did not emerge in a vacuum – there are many politically active groups in Brazilian society –the impact of big events on local communities (the environmental, LGBT, black and indigenous movements to name a few) may surprise us. This political baptism will hopefully make more Brazilians familiar with the chores of public life. On the other hand, the conservative strata of Brazilian society have started to take advantage of the situation. For example, violence by some protesters has been used to justify repression and calls for order, reminiscent of a fearful past. Demands for the impeachment of the current government have started to arise, including a quite paradoxical Avaaz petition. In 2014, presidential elections will take place in Brazil and how the current situation will be resolved or dissolved will have a very significant impact on the vote and the future political agenda of the country. Whatever the future is preparing for Brazil, remember that Brazilian politics always comes with a twist. Joyfulness and irony are very much part of the political paraphernalia and words are bended to serve amusement as well as politics. My favourite slogan from the protests is: “Sorry for the inconvenience, we are changing our country!” Just amazing. Today is World Refugee Day. As the campaign says ‘No one chooses to be a refugee’. You will have seen the photos and film from Syrian refugee camps in Jordan, Lebanon, Iraq and Turkey. And during the Horn of Africa crisis, there were numerous images from the longest running refugee camp, Dadaab, in Kenya. But refugees, despite their relevance, do not represent the largest group forcibly displaced as a result of conflict, persecution and human right violations. In fact, according to the UNHCR, there are more Internally Displaced people (IDPs) than refugees (28.8 million and 15.4 million respectively in 2012). Even more worryingly, the number of IDPs increased by 2.2 million in 2012 (compared to a 0.2 million increase in refugees). Colombia hosts the largest number of IDPs due to conflict with 3.9 million at the end of 2012 (DRC, the second largest, had 2.7). In the last year, this number has been inflated by those fleeing natural disasters such as floods. And in fact, a significant number have been displaced more than once. Though natural disasters – particularly in China, India, Nigeria – result in the largest number of displaced peoples, conflict displaces millions of people each year. But while in the aid sector, IDP is a commonly used acronym, in the Western public’s daily life, it’s more likely to be misinterpreted as the latest computer or insurance firm. Why are IDPs different to refugees, legally and in the way they are perceived and dealt with. Why is there no legal response to protect these individuals? Why are there few laws, and where available, poorly enforced laws for IDPs? Why are IDPs different to refugees? Legally – IDPs are displaced people who have not crossed a national border and so do not receive special status under international law. Practically – often they move in with relatives, friends, or the host community making them harder for aid agencies to reach or easier for them to overlook. But whether you are a refugee or an IDP, you have been forced to move without a choice. Conflict (the recently published Global Peace Index found that the world had become 5% less peaceful or 5% more violent since 2008), natural disasters, poverty, climate change or insecurity all result in families moving from their ‘home’ to new locations. In these circumstances there is rarely an alternative option. Temporary displacement can be just as unsettling particularly when upon return, houses or lands are found destroyed. There are times when this displacement might ultimately result in an opportunity or positive change. However, the basic principle of having to leave your home is alone a very destabilising event, particularly for children, the elderly, disabled or chronically ill. So why is there more focus on refugees than on IDPs? The problems that internally displaced people (IDPs) face are not new but they are distinct. Unlike refugees who have crossed an international border, IDPs remain in their nation state and are thus still the responsibility of their home authority. Because of the status, or lack thereof, that international law confers on armed groups, a sub-group of non-state actors, the law itself is insufficient protection for this particular vulnerable group. Because they have been removed from their community, loosing their livelihoods and networks, the removal of many of their normal coping mechanisms leaves them in a unique situation, which is distinct from that of other non combatants during conflict. There is little doubt that IDPs are currently not sufficiently provided for in terms of protection nor assistance, despite the claim that international law includes clear obligations for the provision of these needs. There are numerous reasons why in reality these obligations are not met which range from specific criticisms of the management of the IDP assistance regime, to wider criticisms of the set up of the international legal system and its continuing verification of the sovereignty of states. As yesterday’s UNHCR report showed, the number of IDPs is rising with ‘global forced displacement at an 18 year high‘. With reoccurring crises and conflict and instability proliferating, the displaced population will play a key role in building stability. Refugees often have terrible stories to tell, but we must not forget IDPs, as they are no less important to global stability and in many circumstances suffer due to a lack of recognised legal status. Last year several large NGOs came together to discuss how to approach the next UK hosted G8 meeting. Mr B Gates even funded one individual to take a sabbatical year to research, study and then write about what the next global ‘advocacy’ campaign should be. 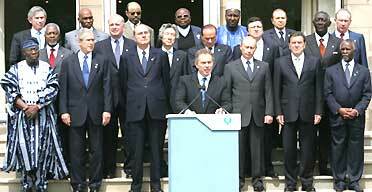 Many of you will remember Gleneagles in 2005 when the UK Labour Government taught the world about Africa and poverty. Make Poverty History or MPH was the campaign for that event. Official evaluators and casual observers both agreed that MPH was a success. Coverage – It reached across the UK, stretched across much of Western Europe and was even found in much of the Global South. Impact – The G8 at Gleneagles was considerably influenced by the asks of the MPH campaign and whether by public pressure or closed door lobbying, poverty found its way firmly at the top of the agenda. Make Poverty History helped push the world to set the Millennium Development Goals (MDGs). Not every member of the public has heard of the MDGs, but many know that there has been a global agreement to end poverty with specific targets for things like health and education [this is not based on scientifically sound research, so feel free to go out and survey your neighbourhood and prove me wrong]. The MDGs have provided a fantastic incentive building momentum and in some countries really pushing progress – see ONE’s recent infographic. The MDGs unified the international community behind the idea of ending poverty. I’m not going to go into a full evaluation of the MPH campaign – I’m far from qualified – but it is important to look at the results of the movement before moving on to discuss the next. The IF campaign was launched in January 2013. Yet it had been growing and developing for many months in advance of that date. When I first heard of MPH 2 it hadn’t even been given a name. It was the coming together of several large INGOs who all recognised the opportunity a new (UK based) campaign would have in 2013 – the 2012 Olympics; the Irish Presidency of the EU; the UK hosted G8; the Australian hosted G20; and the first real milestones of the Post 2015 process. Good foresight and considerable drive and energy for a dozen or so key individuals led to the taking over of twitter with #taxhavensongs this week and the vast coverage of nutrition, tax avoidance stories and transparency in Western media. They know who they are, and we take our hats off to them. Explains the why now, but what has it achieved? Initially I remember numerous aid workers, even NGO advocacy managers, who were completely ignorant of this new campaign. This past weekend has changed this and IF has become more of a household name following the Big IF Belfast, the Hyde Park march and the ONE campaign’s concert at the Tate Modern in London. As we previously wrote, nutrition did not reach the G8 agenda, but it has gained significant coverage and new commitments flooded in to a total of over $4.2billion during the 8 June summit. With the G8 turning to the 3Ts – tax, trade and transparency – the IF campaign has cleverly refocused efforts on these issues. What originally seemed a strange combination of issues pulled together under the campaign slogan of ‘enough food if . . .’ has actually provided the group with the flexibility to react to the changing political landscape. Saturday produced exciting commitments on tax, Sunday proved equally providential. This is step one: we may have won the battle, but the war continues. Will we end poverty this time? Only history will tell, but my general scepticism leaves me inclining towards a misguided hope. Please, let’s prove me wrong. A couple of months ago, at 2am in a stuffy apartment in Yangon – I was busy taping plastic bags to my mattress and spraying horribly toxic bug spray all over the bed frame. A bit of a weird situation (granted, I had had a healthy number of beers by this point) but we had a bed bug infestation. My flatmates and I were covered in a rash of intensely itchy bites, making us weep with frustration and desperate for a solution. A bit of intensive late-night research revealed that not only can these creatures basically survive a nuclear apocalypse, but they are also most commonly found in the houses of ‘transient foreign migrants’. Wonderfully accurate. The apartment belonged to one INGO’s international emergency response team – people came and went through 1 week to 6 month periods. We chose to self-describe as ‘expats’ but the (more pejorative?) category ‘transient foreign migrants’ seems more accurate and the bed bugs certainly weren’t going to differentiate. The political economy of aid, and the way that we elect to describe and conceptualise our own place within this huge, heaving industry is pretty interesting. It is a strange, even perverse, situation which sees Western countries export crowds of over-educated, middle class, eager young people to some of the most gruesome and appalling places in the world. I count myself as one. Places that most sane – and local – people are desperately trying to flee. It’s the nature of the beast, but deserving of reflection. We (the foreigners) are expats because we carry artisan coffee in our suitcases and can afford to pay $10 for a trip to that air-conditioned gym; but we are, nonetheless, migrants who rely on a constructed, parallel economy to the one in which we work. An economic migrant is a migrant of necessity, not choice. However, comparing the ailing job markets back home with the ripe, prolific lists on Relief Web’s jobpage does give pause for thought. As the recession bites, it is now completely normal for young graduates to face months of bleak unemployment and welfare support, casting CVs down a black hole until something (anything?) materialises. But once in the NGO sector it is extremely rare to hear of someone unemployed for more than a few months. At a time when economic migrants are being maligned across Europe (with a good amount of hysteria about the ‘deluge’ of Romanians and Bulgarians forecast to descend upon Britain’s shores– not racist, you understand, just concerned that there will be enough fruit picking/toilet cleaning/manual labour jobs for eager Britons), there is a distinct myopia when it comes to seeing our own economic choices. Working in aid is easily cast in a moral frame, but is also governed by pragmatic decisions (starting a family? UN salary suddenly preferable to MSF’s stipend). I have just moved to Burma as a freelancer, confident(ish) that my professional experience, contacts and contextual knowledge will eventually furnish interesting, paid work. It is a calculated risk, but one dependent on a very healthy NGO market and economy – in one of the poorest countries in Southeast Asia, ranked 149 on the Human Development Index 2012 and featuring several long-standing and brutal civil conflicts. I am hesitatant to cast an ethical spin on all this – it is simply a reality of political (and geographic?) economics, but a collection of issues that does seem to toe a fine line between bizarre and inequitable. A starting anecdote for a different blog perhaps, but relevant considering the previous post on ‘capacity building’: two colleagues, one from Goma, DRC and another from Sierra Leone, both highly experienced, capable individuals working at senior management level – described on separate occasions the frustrating necessity for them to work outside their own countries, in order to ensure they could get a job and salary relevant to their experience, as an ‘expat’. Which just seems downright barmy, given the need for educated, able local people to help develop and invest in their own country, especially in places like Goma. I’m sure everyone has examples such as these, and I don’t pretend to have a solution, because weighting international/national salaries to reduce distortion of local economies makes sense. 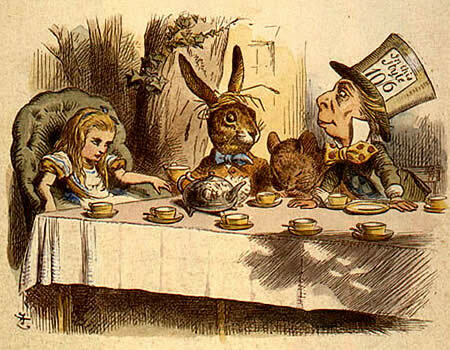 But sometimes I do feel a bit as if I’ve eaten the slice of cake, sat down at the Mad Hatter’s tea party and expected to humbly accept this global economic merry-go-round of absurdities without question. P: I agree entirely. Problem is that there are so many issues in this area of argument, and each are deserving of greater attention… With this particular issue, I think it depends on the local context and the strength of the local workforce – some places there is (arguably) a greater need for expats, and in other places it barely makes sense to have any. It is particularly difficult when organisations working in countries with very strong local capacity still chose to pump in international staff and bulldoze the local setup – a particular problem in emergencies. B: This leads into a very interesting debate about how international organisations should weigh up the fact that expat staff typically have better writing, communication, analytical skills – though certainly not always – while local staff are more likely to have better contextual knowledge, language skills, understand what’s going on (again not always.) My guess is that international organisations tend to favour the person who speaks without a funny accent and who can write a coherent report. But this almost certainly isn’t always the right choice. B: Finally, I completely agree with your point about people needing to move away to get a decent salary. I was struck in East Africa by the merry-go-round effect; Sudanese came to work in Uganda, Ugandans go to Kenya, Kenyans go to Ethiopia, and so on. But yet there’s no obvious alternative – a fascinating blog post if anyone wants to write it? P: I’ve taken out the term ‘national’ that you edited into the final ‘national’ colleagues paragraph- because that is exactly the problem that I’m trying to highlight. Who are they ‘national’ to?? My colleague from Goma is only national if he’s in DRC, but is international if he’s in Nepal, or Kenya, or Haiti .. and then gets the position and salary that his experience deserves. When used as rigid, normative categories, terms like this can have really difficult side effects – like having to work outside your own country just to earn the title ‘international’ and the associated professional dividends.